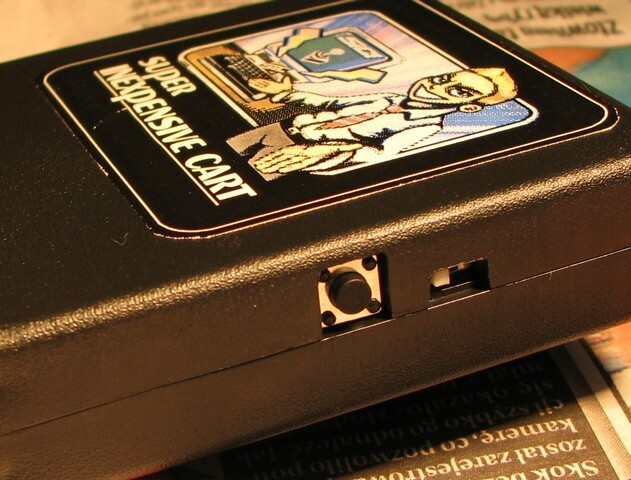 SIC!, wchich stands for Super Inexpensive Cart is intelligent cartridge designed to use with Atari 8-bit computers. It works with flash-memory chips. 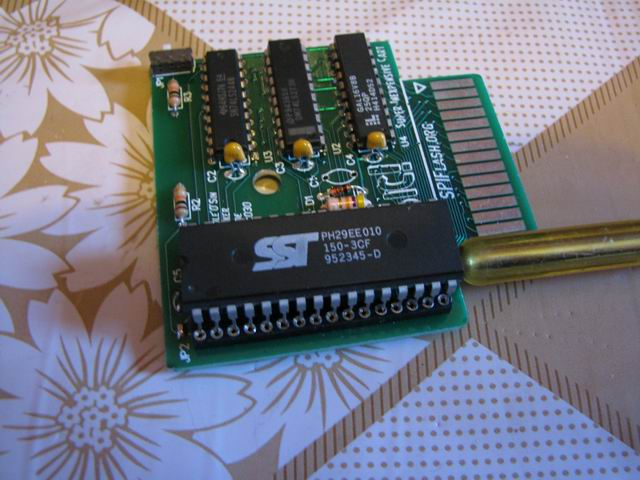 It has both standard cartridge and memory programmer functions. It may be used as multicartridge, where you can place your several favorite games, demos etc. 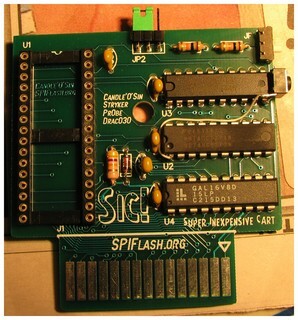 You can also program your SIC! for using as SpartaDOS X cartridge, or use SIC! 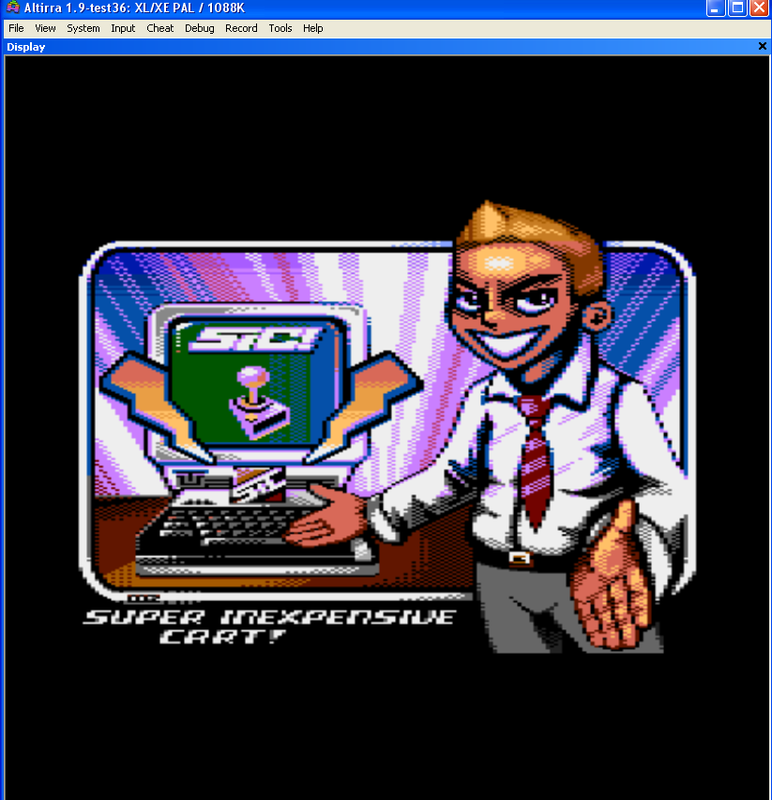 as programmer for ATARI ST/E TOS-chips. 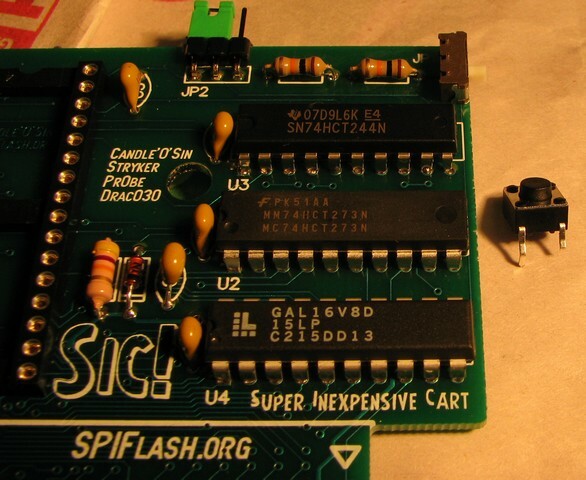 SIC!-cart supports 1- 2- amd 4-Mbit memory chips (respectively: 128, 256 or 512 kilobyte) "5v" DIP-type. The memory in SIC! is banked. The banks can be selected with special register. 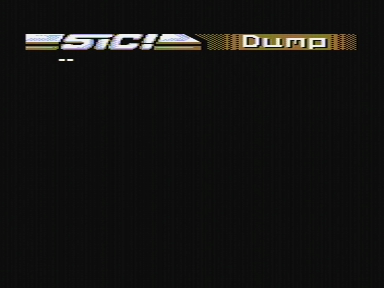 SIC! 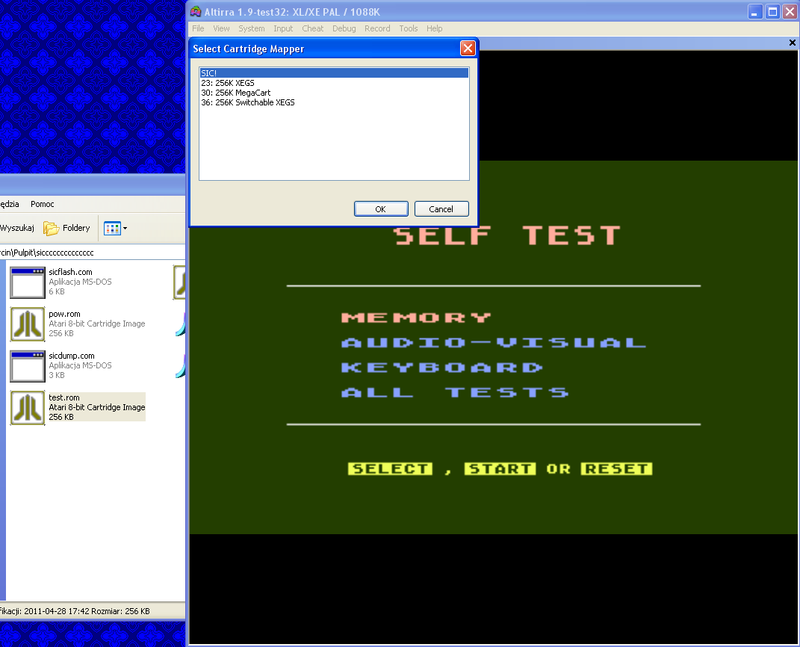 's possibilities can be tested in newest version of Altirra emulator. 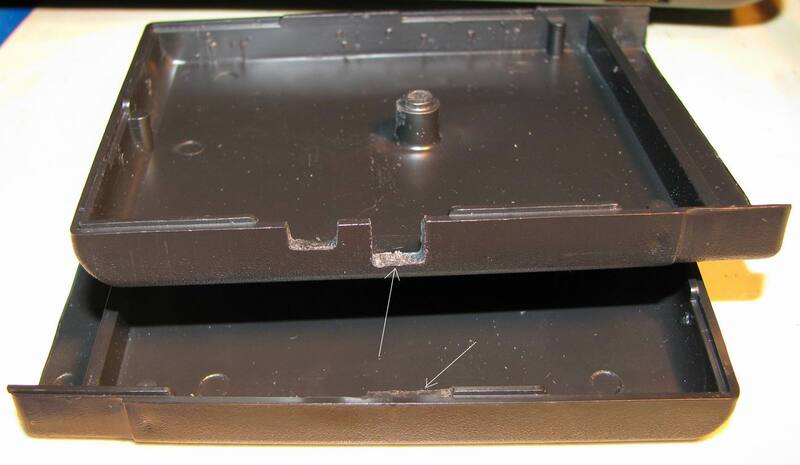 The switch located on cartridge side allows swiching it on/off without necessity of removing it from the socket. 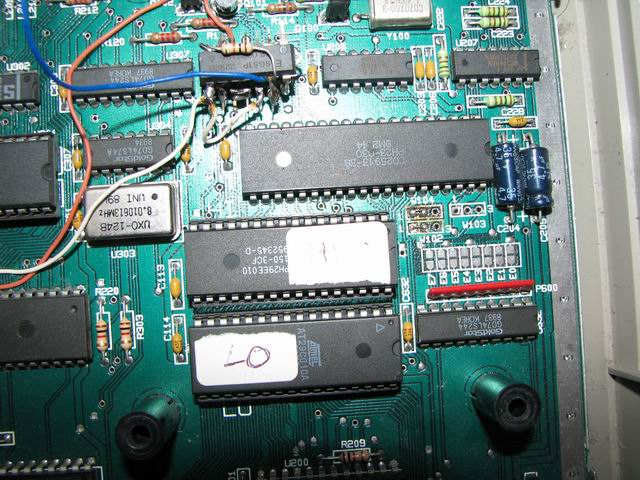 There is also a jumper placed on top (visible after opening the case) which allows you to program chips with other signal-order on pins (just like some 2-megabit chips, with RESET signal on pin #1). 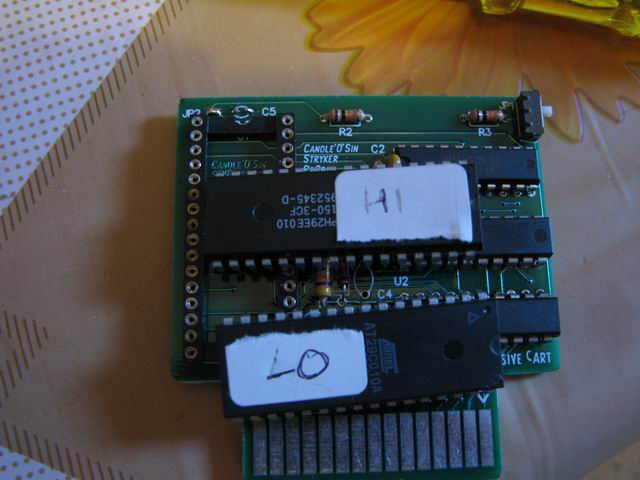 If anyone would like his siccart return to menu after reset, please add momentary button (ie tact switch or any other suitable type technobable: single post single throw monostable switch) between pins #1 and #10 (GND) of U2. 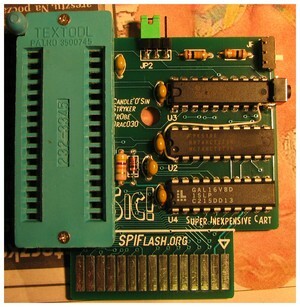 SDX upgrade flasher for Sic! (Atari) - allows you to flash SpartaDOS X on Sic! 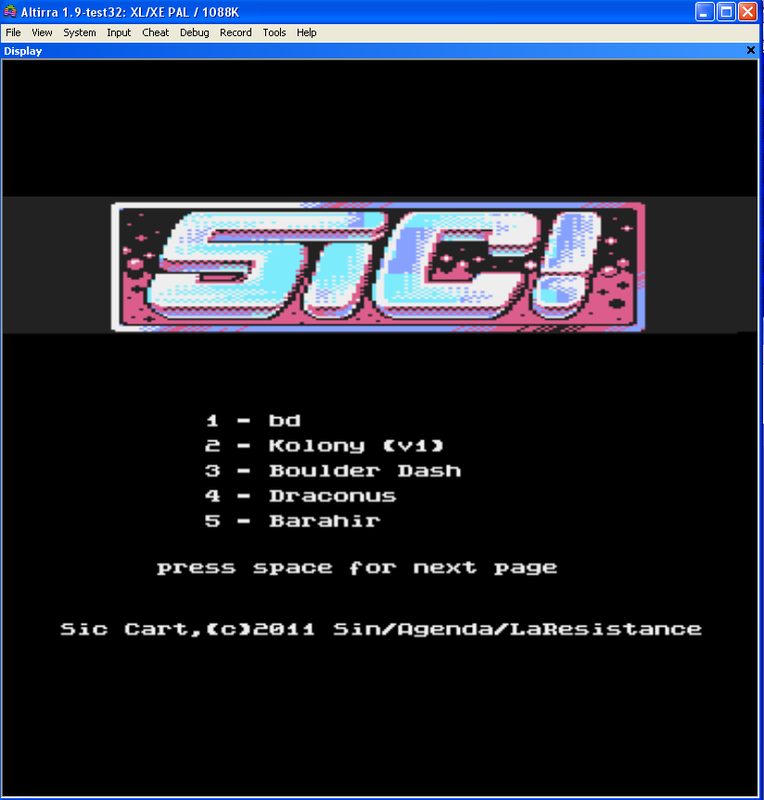 Below are placed the manuals for all the SIC!-related programs. 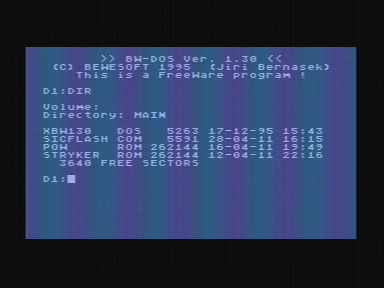 Copy previously prepared files into ATR with DOS (MyDOS or SDX format). 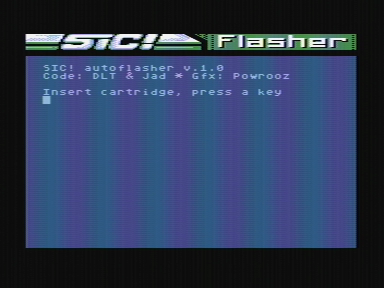 Let's use here Pajero's plugin for Total Commander. 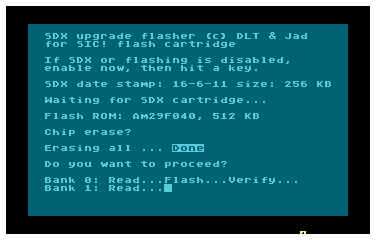 Of course configure it first (according to its manual). 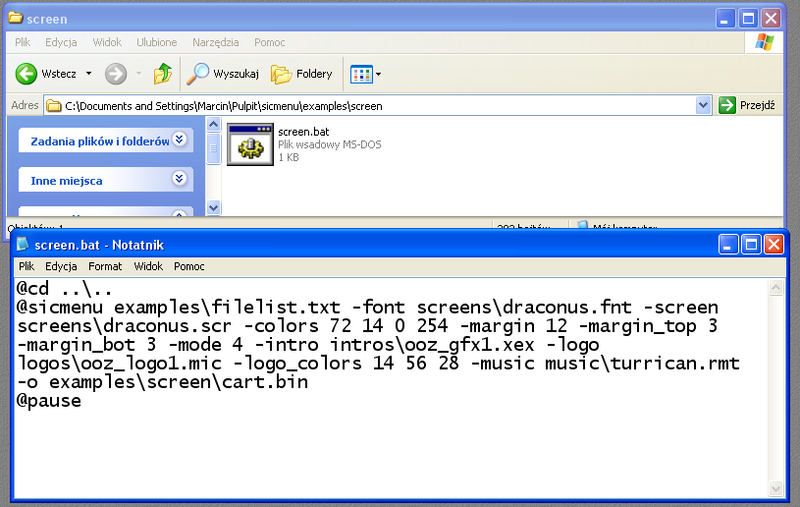 Select the file you want to have in ATR and press "Pack" button. 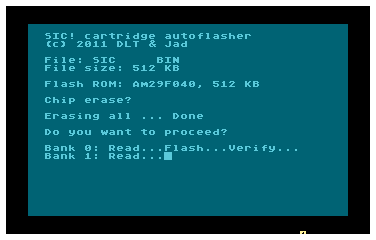 Select "*.atr" packer, press "Configure" button and the set it up like on the attached screenshot, then press OK. 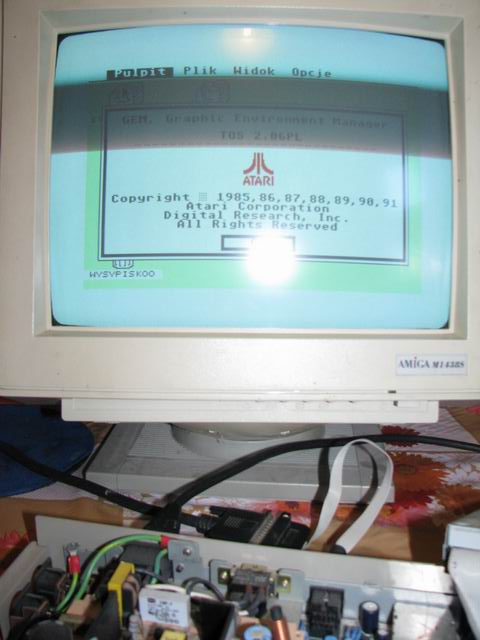 Launch ApeQT (or its equivalent), mount ATR in D1: and boot atari with OPTION pressed (without BASIC). 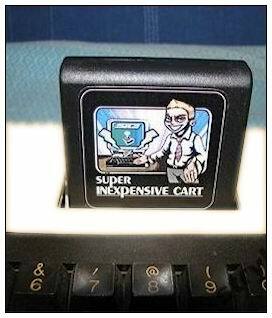 SIC!cart should be switched to OFF. 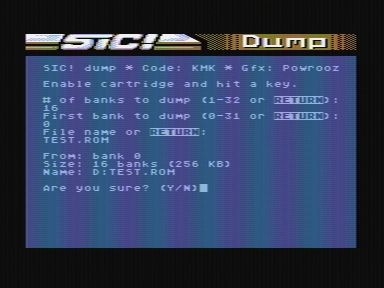 Of course SIO2PC isn't required here - you can use SIO2SD, SIO2IDE, ... or even real floppy as well. Now ATR contents is shown, select ie. "stryker.rom" by pressing "D"
Program will then ask for erasing flash-memory, press "Y"
After finishing, the program will diplay "Done" text and ask if you want to "re-flash" or not. 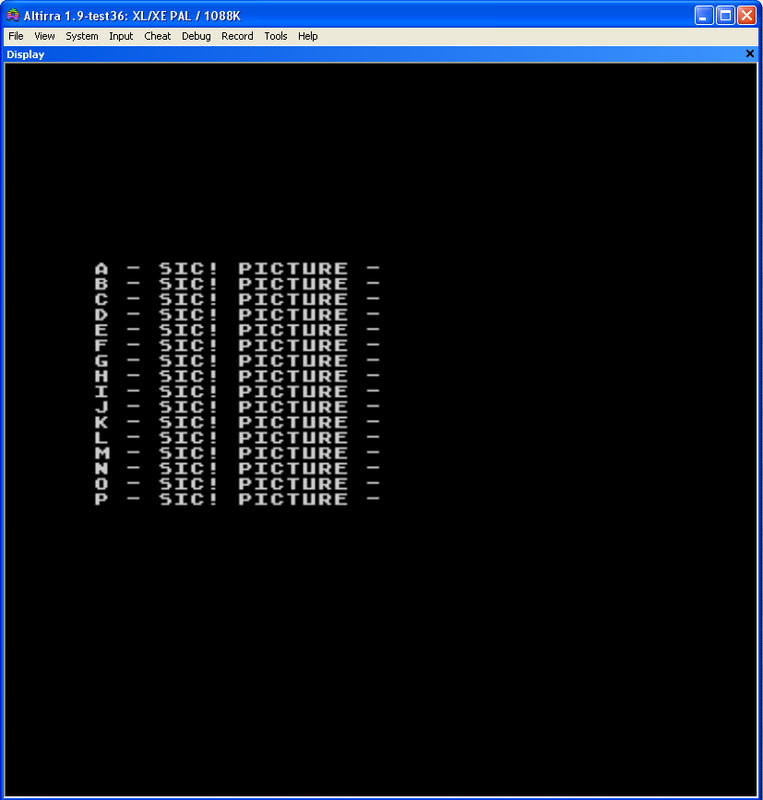 Choose "N"
Atari should boot from cart and then the picture from Candle's SicGenerator should appear. 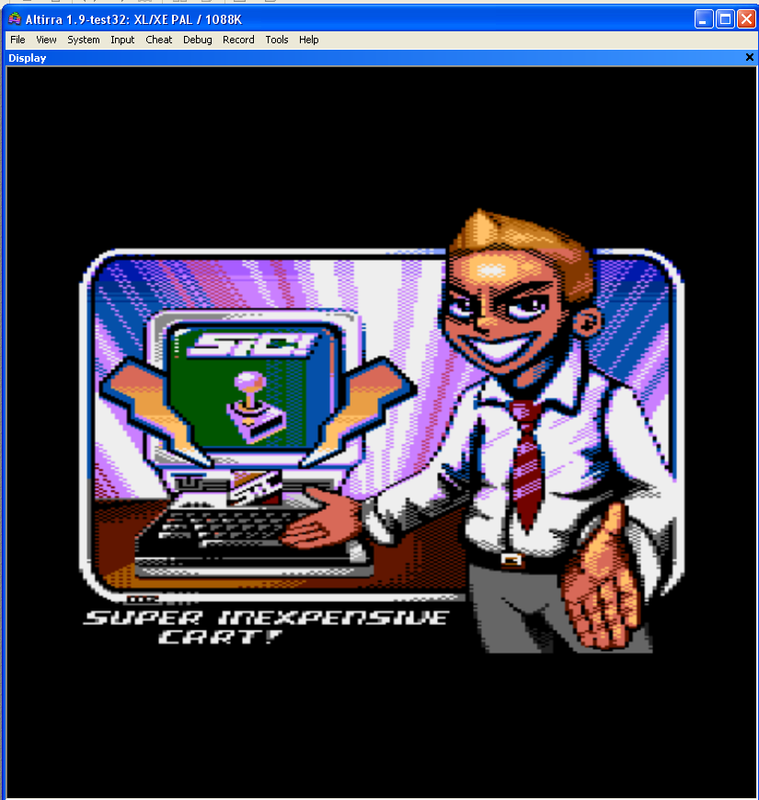 Now you have ready-to-use SIC!cart with music and games. If there's more than 5 games, you can switch between screens using SPACE BAR. Pres 1 - 5 to load desired one. 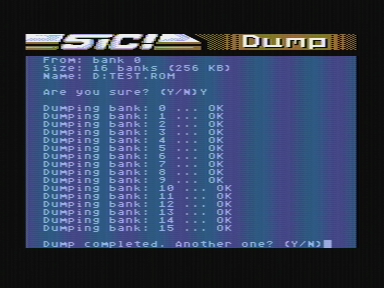 Copy "sicdump.com" file into some ATR with DOS (MyDOS or SDX format). 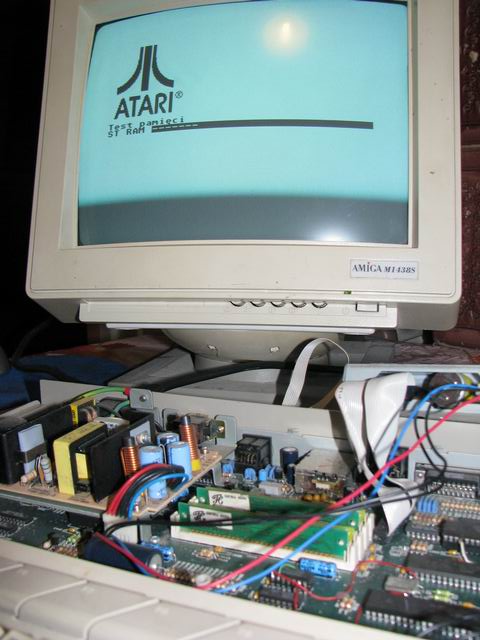 Launch ApeQT (or its equivalent), mount ATR in D1: and boot atari with OPTION pressed (without BASIC). 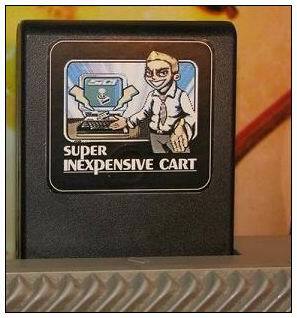 SIC!cart should be switched to OFF. 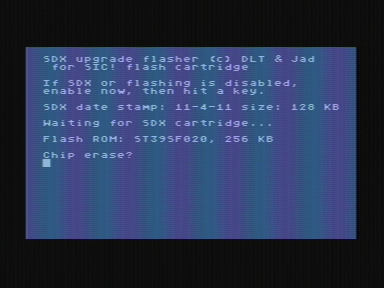 Of course SIO2PC isn't requred here - you can use SIO2SD, SIO2IDE, ... or even real floppy as well. 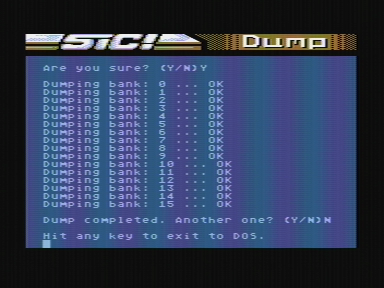 When the program asks if you are sure of the above, press "Y"
After finishing, the program will ask if you want to "re-dump" cart or not. 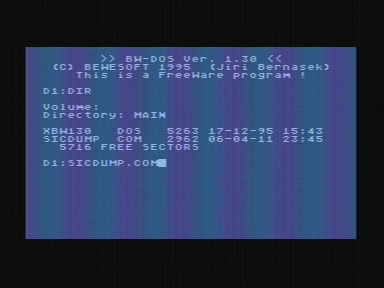 Choose "N"
type "DIR" (or select it from menu, depends on DOS you use), to make sure you have succesfully dumped cart into a file. 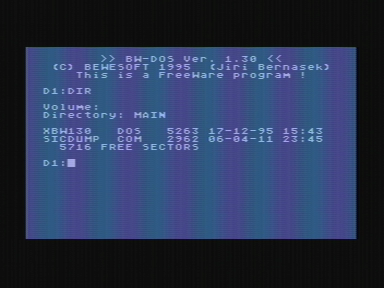 Type in filemane (ie. 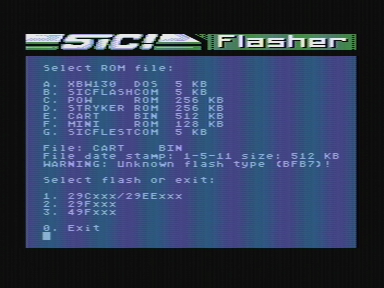 test.rom) and click "Save"
Newly created file before flashing it on SIC!cart you can test on latest Altirra. Just drag it onto emulator window, select SIC! and it will run. 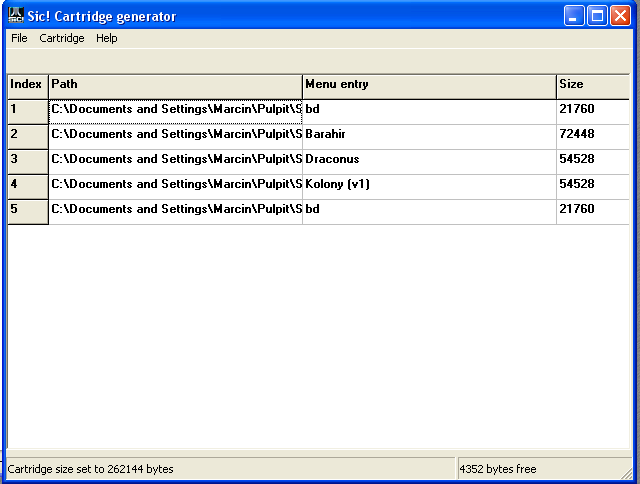 When you write to file, there is also "Save ATR image" option. 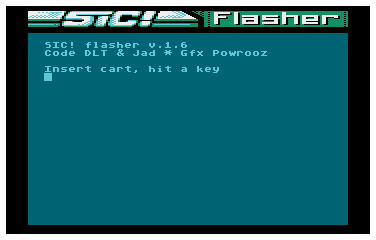 When you choose it, our ROM will be saved to a ATR-file together with Sicflasher. 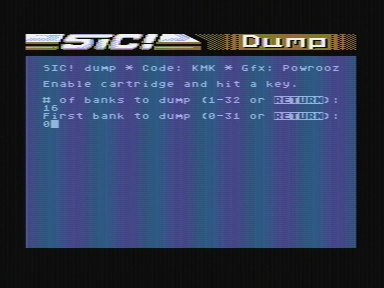 Switch SIC!cart to ON and press SPACE BAR. 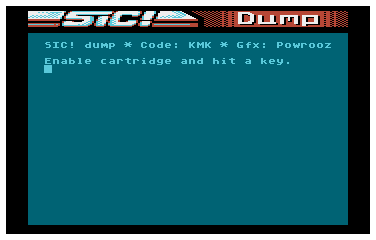 The file will atuomatically load and memory gets erased. 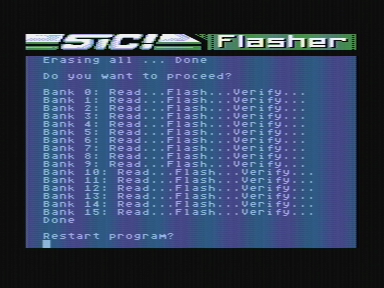 The the program will ask if you are sure to continue with flashing. Choose "Y". After finishing "Done" text will appear. 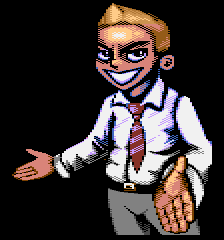 Press "N". 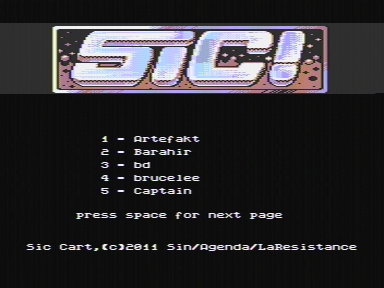 Now your Atari should boot form SIC!cart. 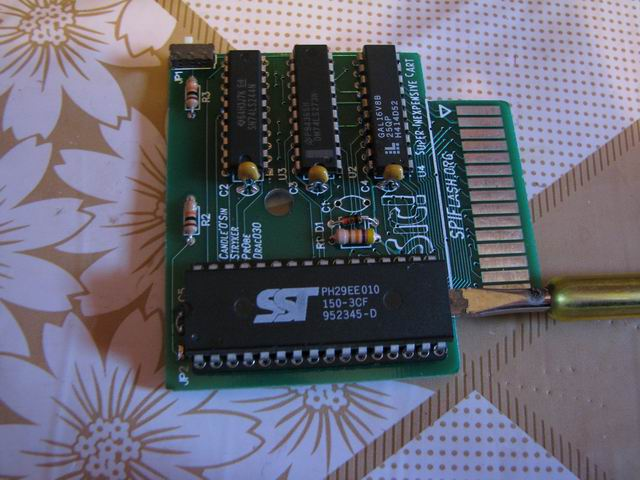 Mount SDX443_siccart.atr (using AspeQT, APE or other similar program). Boot atari with SIC!cart switch in OFF position. 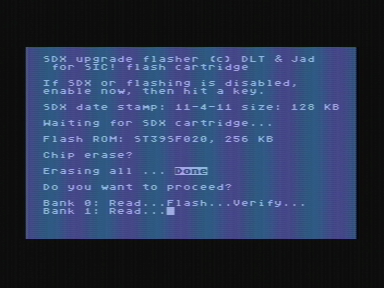 When flashing process ends, "Done" text will appear on screen. 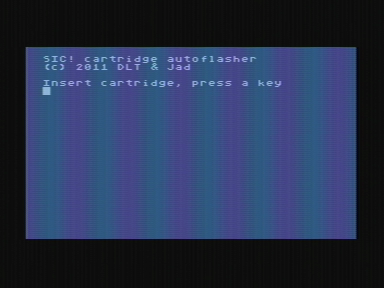 When then program asks for restart, press "N". 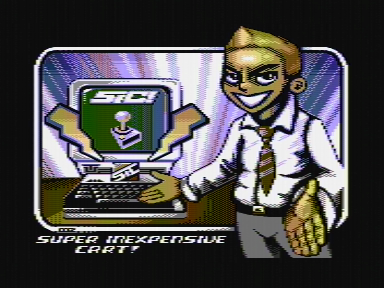 Atari will reboot SpartaDOS X launches from SIC!cart. 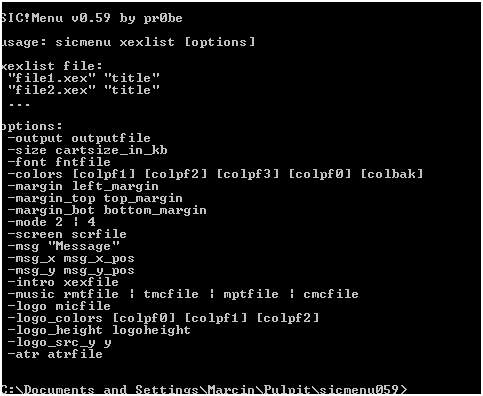 Another sample is Examples directory is "logo"
Of course such a executable file you can done yourself. More detailed manual soon. 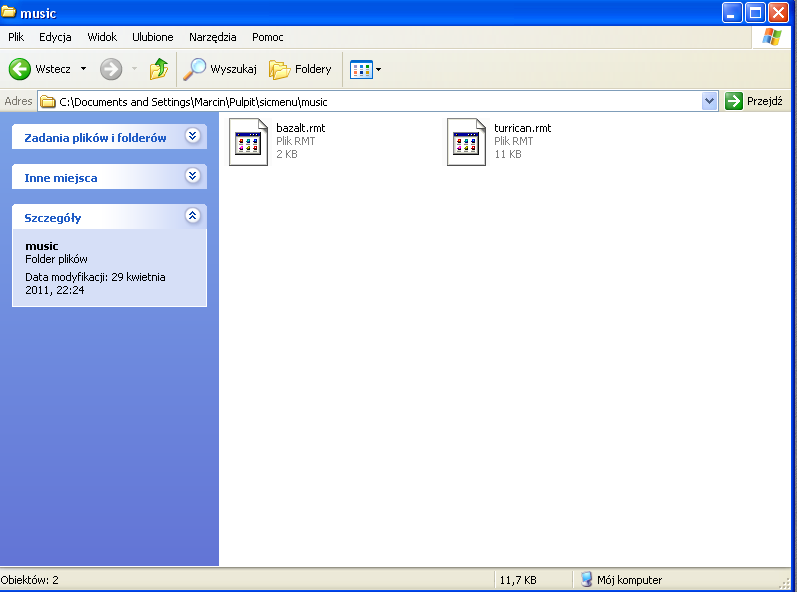 Download TOS 2.06PL file (for example) from site: The TOS is splitted into two 128kB files (with extension .hi and .lo). Of course you can split the ROM yourself but it will be described in another article. 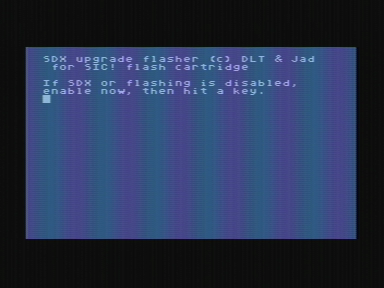 Set up the plugin and hit "OK"
type "DIR" (or select it from menu, depends on DOS you use), to make sure you've booted right ATR. 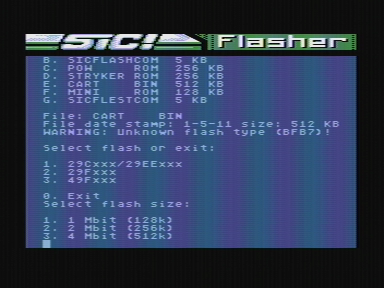 Launch "sicflash.com" file. 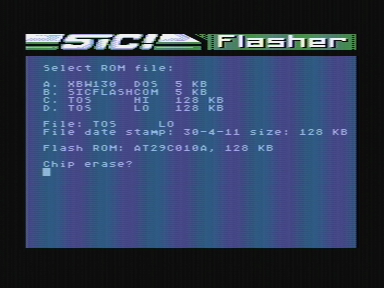 Select file for flashing - press "C"
Erase flash-memory by hitting "Y"
When it comes to the end "Done" text will appear. 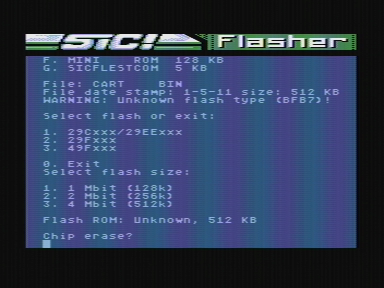 Switch the power off, remove SIC!cart, replace flash-memory chip in it and sign newly flashed one as "HI"
Repeat 8), 9), 10), 11), in 12) select "D"
To continue with flashing press "Y"
When it comes to the end "Done" text will appear. 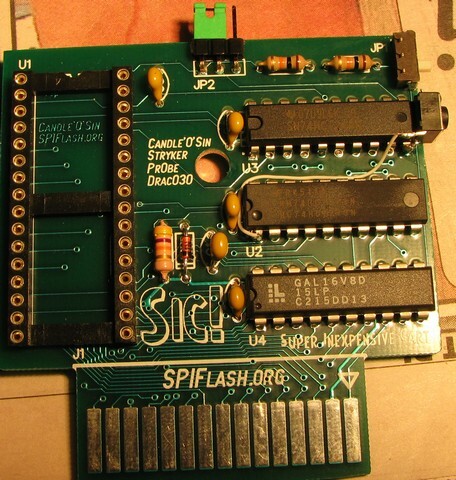 Switch the power off, remove SIC!cart, remove flash-memory and sign it as "LO"
Unscrew and open Atari STE and search for "old" TOS chips (in this model they are placed near disk drive), remove these chips and replace with flashed ones. 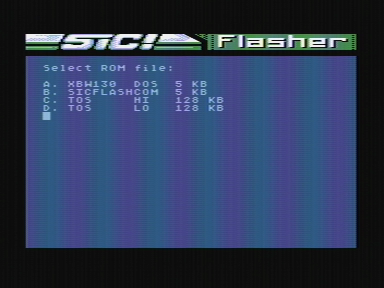 After booting check TOS version (in this case it shold be 2.06PL) That's all! Simple, isn't it? 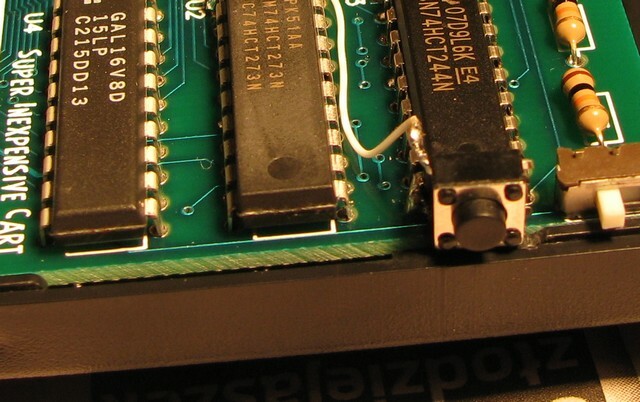 In other manuals there will be written how to flash and mount 2 or 4 TOSes using 2 or 4-Mbit flash memory (and thus one or two switches). 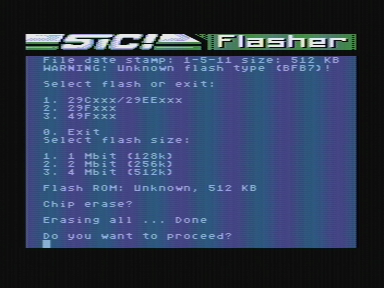 If you see this text, it seems that flash-memory hasn't been identified. 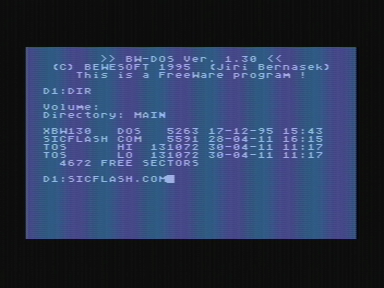 You may see code like "BFB7" (it may be found in current flash-memory manufacturer's datasheet). 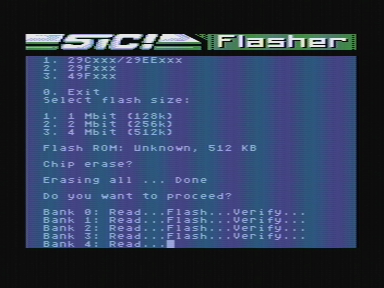 It means that current flah-memory type is SST39SF040 (it was added in newer version of sicflash). 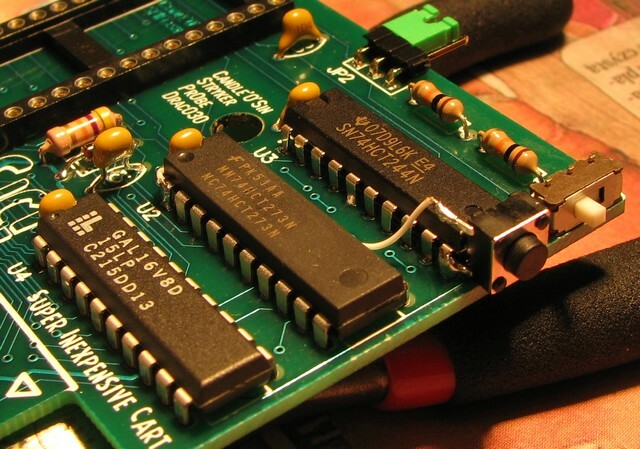 If you want other memory type to be added, please send me infos about capacity (1,2,4 Mbit), its symols, and the way of programming (1,2,3). 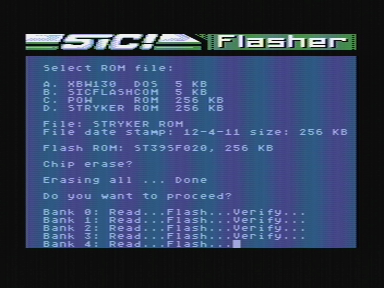 Now hit the keys "1" and then "3", because you know it's 4Mbit flash-memory. 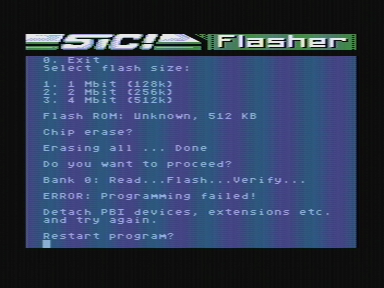 The flasher starts to work... but the error occured after veryfying... 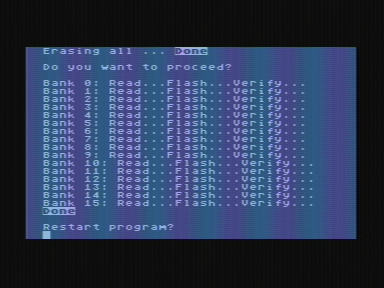 It seems that you have chosen wrong type of programming. Press "Y" to restart flasher. 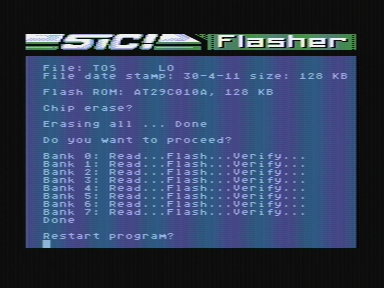 Now the flashing passes without errors. And this text is the proof of it. 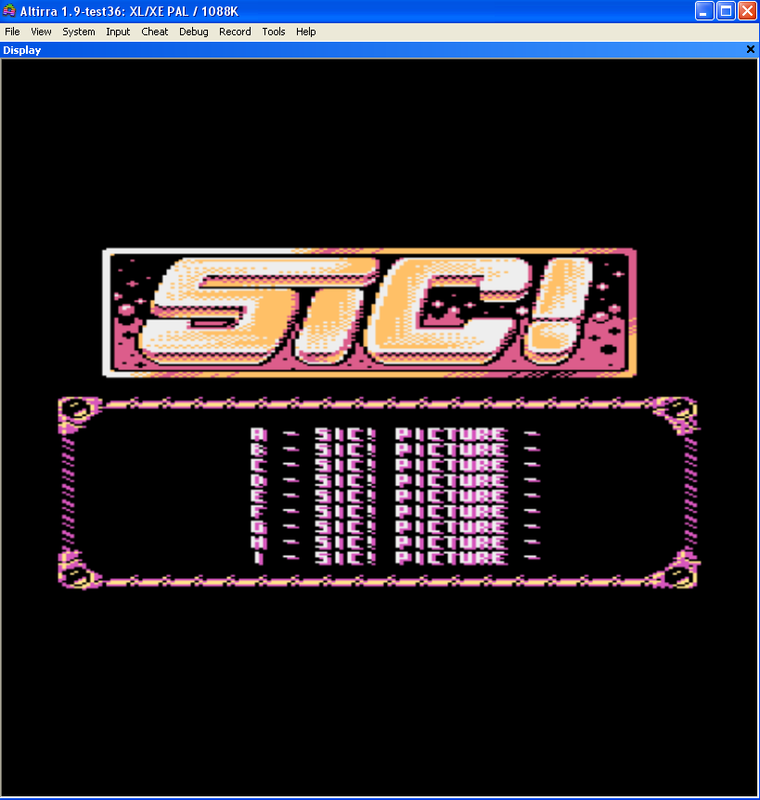 in final version of SIC! board - set the jumper into 2-3 position. 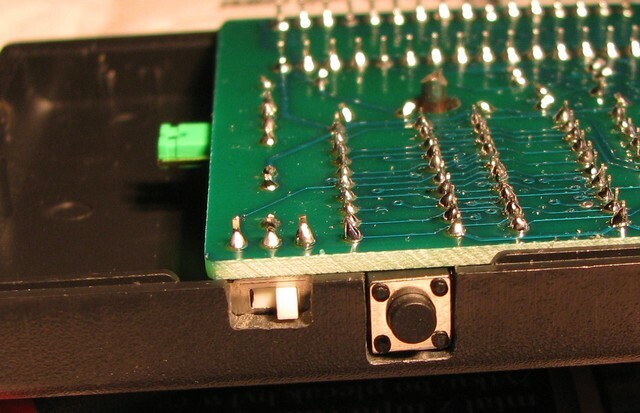 Buy a 1,5-3 mm microswitch button (in appropriate store), cut two pins on one side (as seen on the photo), and also slightly cut one pin on the other side (try with a multimeter if they short-cut - they should) and solder it to pin 10 of U3 IC. 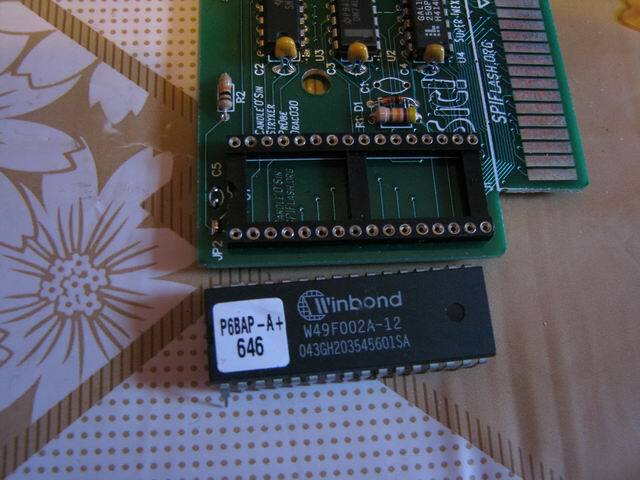 Upper pin connect with a wire to pin 1 of U2 IC. 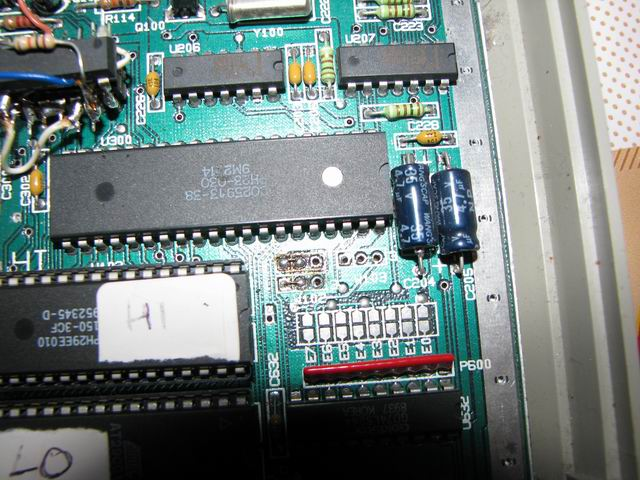 Additionally stick that microswitch with a drop o glue to U3 IC to hold it in one place. 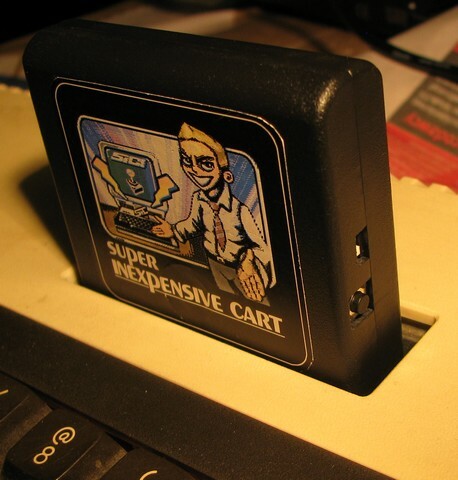 Cart inserted into ATARI 800XL.How does it work? 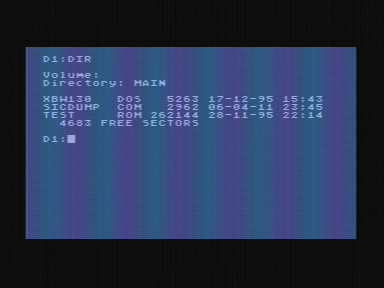 Select some game from menu. 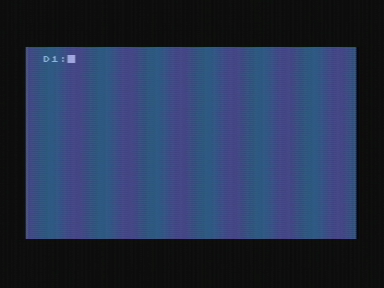 When fed up with it, just press mounted swich one time and the RESET in Atari. A menu will appear in a while. 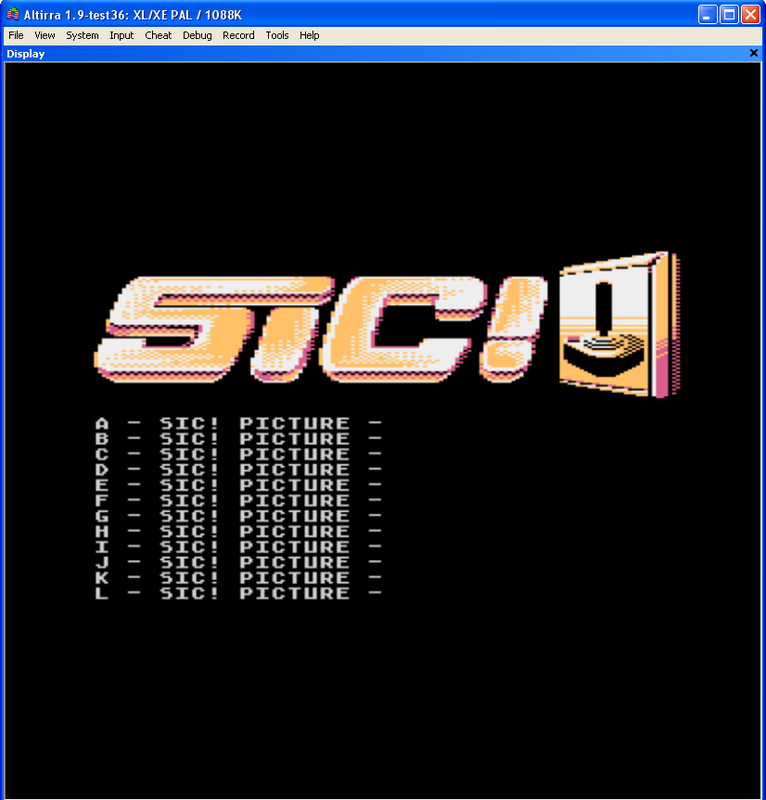 Below there is ROM-images generator for using with SIC! 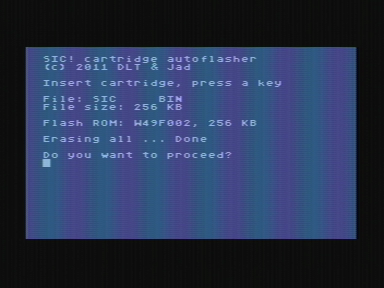 cartridge. 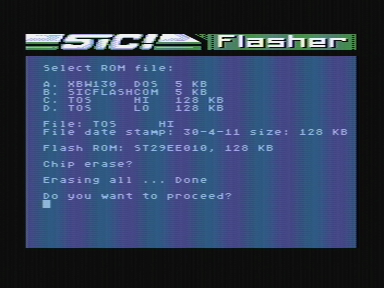 It allows you to prepare .rom files for flashing onto 128-, 256- and 512kB cartridges from files placed on local disk or executable files (like COM, EXE, XEX) from the Internet. Using the form below you can easily contact the SIC! crew. Please sent messages only related with the project. Sending spam can (and will) disallow you from using this site.